Featuring fresh mixed mushrooms and sweet onion, this extra-flavorful gourmet classic is extraordinarily easy to make. 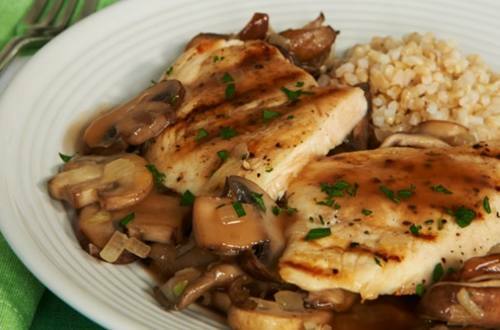 1 Reduce Marsala wine in large skillet until syrupy consistency. Stir in water and Knorr® Homestyle Stock - Chicken and bring to a boil. Whisk in cornstarch blended with 1/4 cup water until smooth and slightly thickened. 2 Rub chicken with 1 tablespoon olive oil. Grill in hot grill pan, turning once, until chicken is thoroughly cooked. Remove chicken from grill pan; keep warm. 3 Heat remaining 2 tablespoons olive oil in another skillet and cook mushrooms until tender and starting to brown. Add onion and garlic and cook until tender. 4 To serve, slice chicken into halves. Arrange 1/2 of the mushrooms on serving platter, then top with chicken and remaining mushrooms. Pour sauce over and sprinkle, if desired, with chopped fresh parsley.